Cute little monsters engage in a fierce bidding war for delicious diamonds. Monsters love diamonds. C’mon, we all know that. And in Diamonsters, this monstrous fact is played out. This is a four-player bidding game, about as simple and easy to learn as it gets. But what's memorable are the adorable monster drawings and the snazzy blue diamond tokens you’re trying to earn, not the gameplay. There are five monsters in Diamonsters, ranked from one to five. And all but one monster has diamond printed on the card, noting its diamond value. Each turn, you flip over a card in the draw deck, revealing the monster everyone is bidding on. And then everyone secretly picks a monster from their hand to place their big. Highest bid wins. Easy right? Well, two things. Ichi, the lowest ranked monsters (at just 1) can only beat one other monster and that’s Go, who comes in ranked 5. So if someone plays Go and you play Ichi, you win. That other twist? Any cards of the same type cancel each other out. So if another player also played Ichi, both of you would be knocked out of the bidding. The goal is to either collect three of the same monster or to earn a total of five diamonds. Remember, monsters have diamond values separate from the bidding value. Oh, and one monster actually eats two diamonds when he's in your collection. Whoever meets that goal first, wins a diamond token. First to three tokens (in a 4-player game) wins the whole shebang. If that sounds too simple for your liking, then, like myself and my gaming friends, you may be left a little underwhelmed by this otherwise adorable game. Each group I’ve played with has had the same reaction. Everyone agrees it’s an enjoyable game, but no one wants to play it again. I like Machi Koro and this is from the same artist/designer, but I also want my games to never be simple to the point of being uninteresting. Reveal the card to bid on. Everyone makes a secret bid with a card from their hand. Duplicate bids cancel each other out. Highest number remaining wins (unless there is a 1 and a 5 played, then the 1 wins). Winner places bid card and card won into their collection. Check to see if anyone won (total of five diamonds or three of the same monster in reserve). The classic card game of War, except you’re choosing which card to play. You guessed correctly that everyone else was going to play the same card, and won by default after they knocked each other out. Someone won in two turns, without anyone seeming to have much of a chance to catch up. It’s an inexpensive game, but the cards are quality. Great art and the diamond tokens always catch new players’ fancy. Takes no time at all to teach and learn. CAN YOU PLAY THIS GAME DRUNK? This is a kid’s game. But you’re not a kid, are you? So… drink up! Someone can often win a round in two turns (about a minute of play time). HOW CAN I DISLIKE A GAME THIS CUTE? I don’t! But in all honesty, none of my gaming group – several of them very casual gamers – came away loving Diamonsters or wanting to play it a second time. You want something to play with young kids. You dig fun art on your cards. You’re in the market for a new, simple micro-game. Questions about Diamonsters? Ask in the comments. 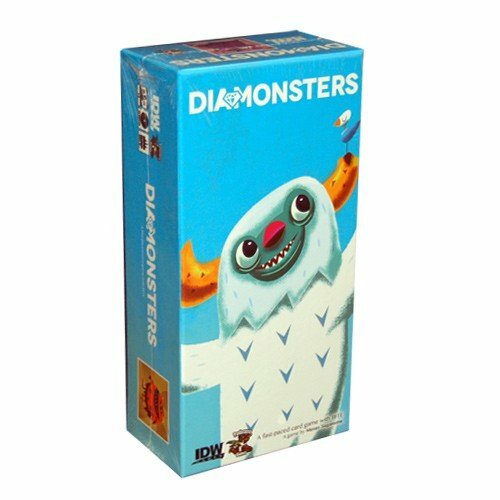 Played Diamonsters and have your own opinion? Tell us! We may feature you in the Dog and Thimble Podcast.